I am getting very excited right now, about teaching a workshop this weekend for bellydancers who are interested in fire props. I love fire dancing, I actually began as a fire/circus skills performer before I really got into bellydance. I found fire poi first, after watching a friend perform. There is something magnetically hypnotic about the combination of sound, light and movement and I knew it was something I had to have a go at. I started out, as any reasonable person would, with the non-firey kind. Sock poi, tail poi - that sort of thing. I practiced obsessively, studying books, videos and participating in forums. My internet was tuned into Home of Poi for months on end. I expanded my repertoire out into flags and meteors. I tried a bit of staff too, but that never really took for me. 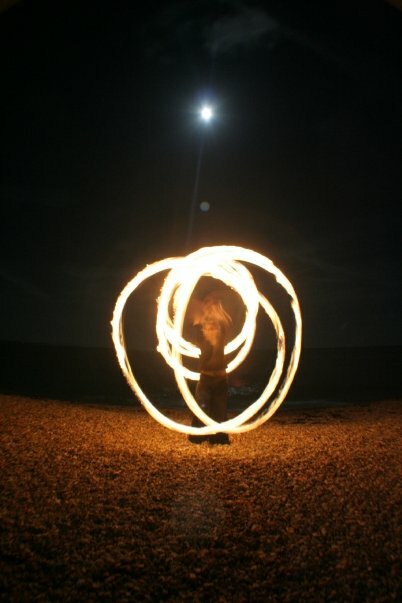 My first fire poi were a standard rolled wick set, from which I graduated to cathedral heads and double heads. The cathedral poi are my favourite, they don't burn quite so long, but their flame is immense. The old adage "If you play with fire, you'll get burnt" is absolutely true. It is impossible, in my experience, to train in firedance with the frequency and duration it takes to become accomplished without taking some damage along the way. Lighting up, hot metal fittings, even the most well-rehearsed tricks sometimes fail - but that's all part of the journey. I once read a saying about dance "Don't practice until you get it right, practice until you can't get it wrong". That goes double for anything involving fire. Most of my fire performances are improvised, but I still don't perform any steps or tricks with fire that I haven't completely nailed in cold practice. I began bellydance classes because I felt that I wanted to get more dance into my fire dance. For many performers, particularly of spinning acts like poi and staff, the focus of the performance is the prop, I wanted to bring out more of a dance element. Unexpectedly however, I found myself loving bellydance in it's pure form, and for a long time I didn't want to detract from my dance with a prop. It is very easy for a dance performance to become all about the prop, when dancing with something impressive like Isis wings or sword, set something on fire and that effect is magnified. I wanted to be absolutely sure I was not going to end up a "lazy" performer, relying on my props, so I didn't "cross the streams" between fire dance and bellydance for several years. As I begin fusing fire and bellydance, I also took on new props. Bellydance with poi is entirely possible, but as the poi are a very "busy" prop, too much dance in there can make the performance confusing. You want to be able to flow around the performance area, make good lines, deep backbends etc, but nothing too complex. As I was also beginning to fuse some burlesque into my dance style, I decided to start working with fire fans, which are a lot more versatile in terms of energy and lines. I came to fire palms last. Fire palms are a versatile prop that can be used quite subtly and is easier to wield indoors and in smaller spaces. I'm always keen to perform with fire, though at a professional level there are quite a lot of hurdles and red tape! Open air concerts and festivals are often willing; indoor shows are a bit trickier, as it requires permissions and insurance from the venue and many theatre and club venues won't allow candles, let alone paraffin-soaked kevlar! Safety is a major issue with fire performance. My insurance stipulates a 2 metre marked clear zone, suitable extinguishing equipment and various preparation and packing up protocols. It's important to have these in place, regardless, at any performance no matter how informal, as these are the simple measures necessary to best ensure that not person or property is harmed by fault of the performer. Of course this isn't going to stop the occasional random numpty from walking into you (though hopefully your spotters will), but it does make it easier to prove that it was their fault, not yours if they sue you (and the insurance makes sure you can afford a lawyer to help with that). But once you've cut through all that, you're left with music and movement and flames. The thrill of the intense spectacle of fire performance, whether I am watching or dancing, never goes away for me. Become a top bellydance critic in 5 easy steps!